Manchester City combated a late Everton onslaught to reinstate their impressive form as Yaya Toure's first half penalty earned the hosts a hard-earned three points. City were struck with an enormous blow just a few minutes in. Star striker Sergio Aguero fell to the ground holding his leg in agony. The injury visibly came due to the Argentine tripping over, and stretching the top of his leg. Pellegrini's men soon, however, took the lead after they were awarded a penalty; due to Phil Jagielka's clumsy challenge on James Milner which was briefly contested by The Toffees. 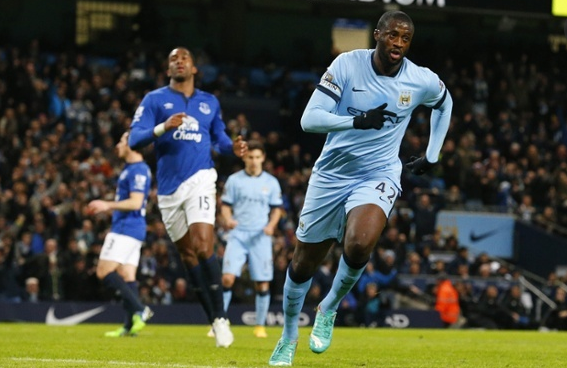 Yaya Toure stepped up, and The Ivorian confidently steered the ball past Tim Howard to direct his team into a 1-0 lead. 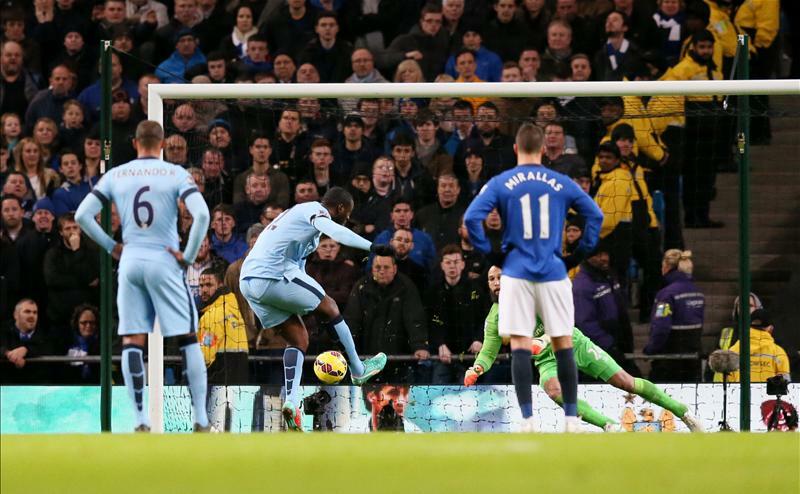 Everton briefly scrambled in their own area after Navas's low, driving cross caused bother for the visitors. Toure dribbled around the box until Jagielka evenually cleared danger within their box to prevent City doubling their lead. In one of few bursts forward, Everton almost leveled. Lukaku raced forward, until Coleman overlapped on the right where the Irishman cut back to Mirallas who's fierce strike was deflected and bounced out for a corner. City dealt with it unharmed. The first half concluded with City leading their visitors by the one goal, Yaya Toure's penalty being the deciding factor of the scoreline. Pozo met a flying deliver steered into the area, his shot swung to the opposite side of Howard's travelling direction but somehow The Australian manages to stick a leg out and deny the 18-year old filling in for Aguero. Martinez's men showed signs of real energy with Barkley's presence, who continued to knock the ball in Mirallas's path who scorched down the left several times, zipping past Zabaleta who failed to keep his Belgian opponent under control. The visitors were just lacking killer instinct. Milner had been fantastic all night long, and it showed again as The Englishman romped down the left and caused Everton's defence many problems. Nasri arrived in the centre, however the French midfielder was unable to effect The Toffees with his nifty dribbling. Lukaku banged a terrific strike towards Hart's goal, but the Englishman impressively steered his attempted effort around the post. Everton's efforts were combated by City's impressive defensive efforts as Martinez's men sadly lose out, to, arguably the better side. City were pushed to the limit by Everton, and the hosts proved their worth as a defence unit to keep The Toffees' attacking firepower at bay late on. Pellegrini's men now close the gap to Chelsea.